In America, there is only one surefire way for fallen celebrities to rehabilitate their broken images in the eyes of the public: wear a silly outfit and learn to dance on television. Which explains why embarrassed Olympic swimmer Ryan Lochte will reportedly be joining the cast of Dancing with the Stars next season. Can he shimmy his way to forgiveness? While ABC has not officially confirmed the news, USA Today reports that the medal-winning athlete, who has been making the rounds on TV to apologize for his Rio Olympics vandalism scandal, will be a cast member on the show in its 23rd season. Dancing with the Stars returns on September 12. 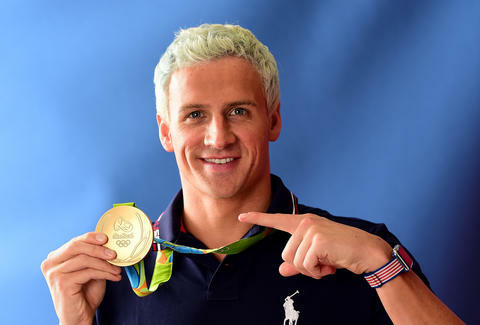 Since the gas station incident and the subsequent fallout, Lochte has lost a series of high-profile endorsement deals with companies like Speedo and Ralph Lauren. Deadline reports that Lochte's Dancing with the Stars deal was being worked on before the scandal broke, but it's hard not to see this as an attempt to endear himself to the public, who have cast him as a villain in recent weeks. At the very least, swimmers are probably good at dancing, right? Lots of intense breathing and flailing limbs -- he'll be a natural.